Yet another build based of one of my all time favorite films, the 1933 horror classic “King Kong”. For those of you unfamiliar with this movie, first of all, what planet are you from? 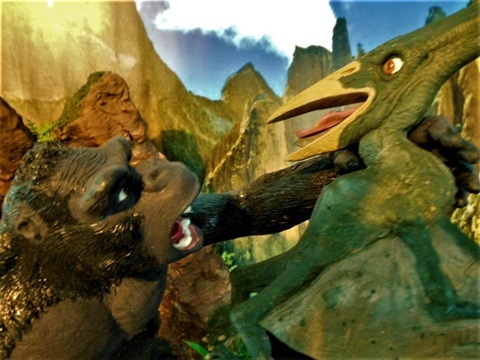 Secondly, this scene occurs about two thirds of the way through where Kong and his lady love, Ann Darrow, takes a breather at his hideaway, high up on the cliffs of Skull Mountain. 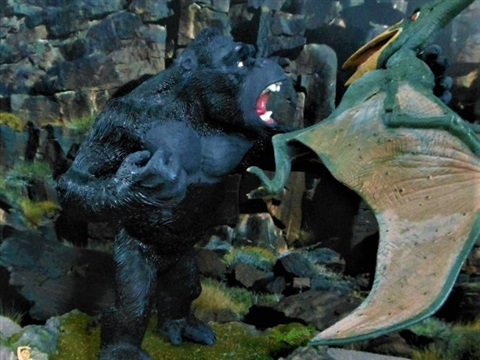 Hearing a noise back in the cave caused by the film's hero, Jack Driscoll (who is in hot pursuit to rescue Ann) Kong puts the hapless lass down to investigate. 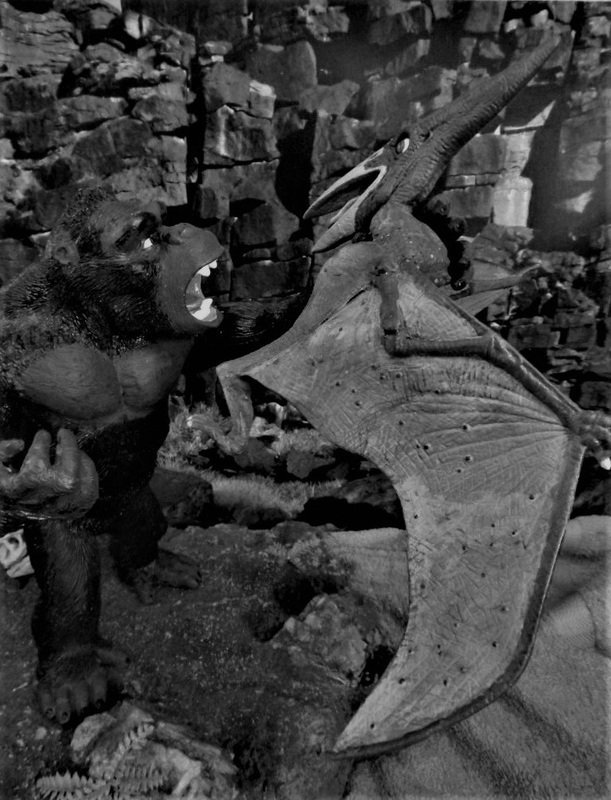 While Kong is distracted, a hungry pteranodon flying by spots Ann and decides to swoop in for what appears to be an easy meal. 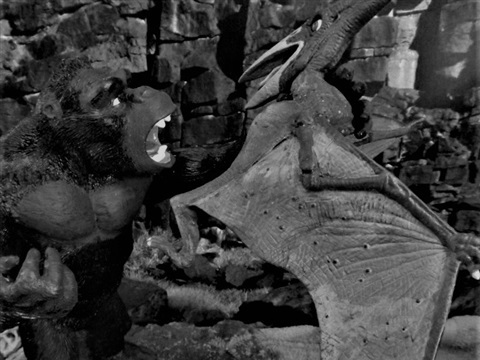 Her screams bring Kong a running whereupon a battle ensues between the flying reptile and Kong. Needless to say, Kong is victorious. My build is based on the midway point of this battle of titans. 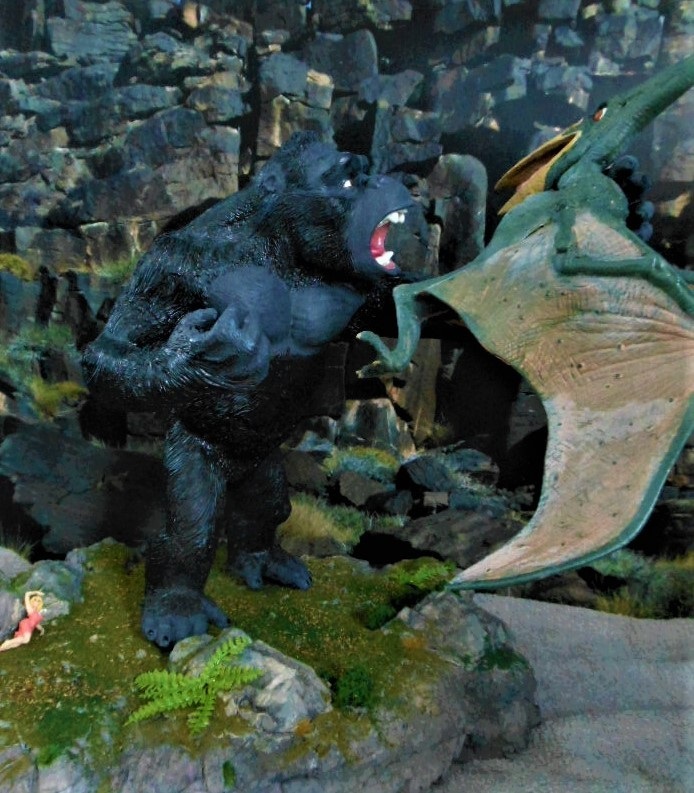 The Kong figure is a vinyl kit from Dark Horse and stands roughly twelve inches tall. I have used this kit in the past for another build I call “An Unexpected Stop” which you can see in the King Kong area of this site. I like this kit because it is fairly inexpensive (fifty bucks or so on eBay and elsewhere) and that it is made out of vinyl which makes repositioning the figure easier than if it were solid resin. The pteranodon is an old kit from Aurora that is readily available on eBay for as little as twelve bucks. 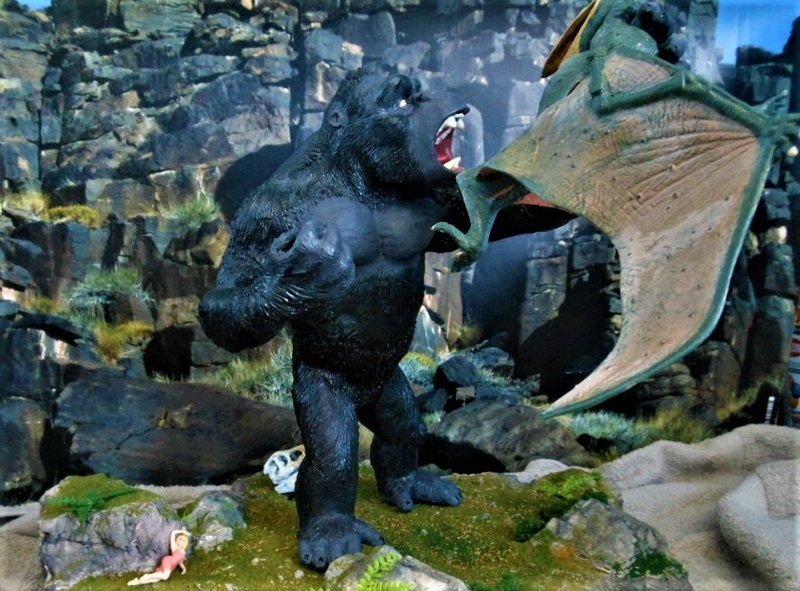 It is a pretty good plastic kit with a nice level of detail and though it is a tad smaller than the flying monster in the film, it filled the bill quite nicely for my needs. I had to use a heat gun on both figures to get them into positions that suggested a battle in progress but this went pretty well particularly with the pteranodon since the areas I had to bend were solid plastic. I painted the figures using acrylics after applying a base coat in gray primer to aid in adhesion. The pteranodon's color scheme was pretty much out of my own head although some have used fairly garish color schemes. Since the film is in black & white, I could pretty much use any color scheme I chose. 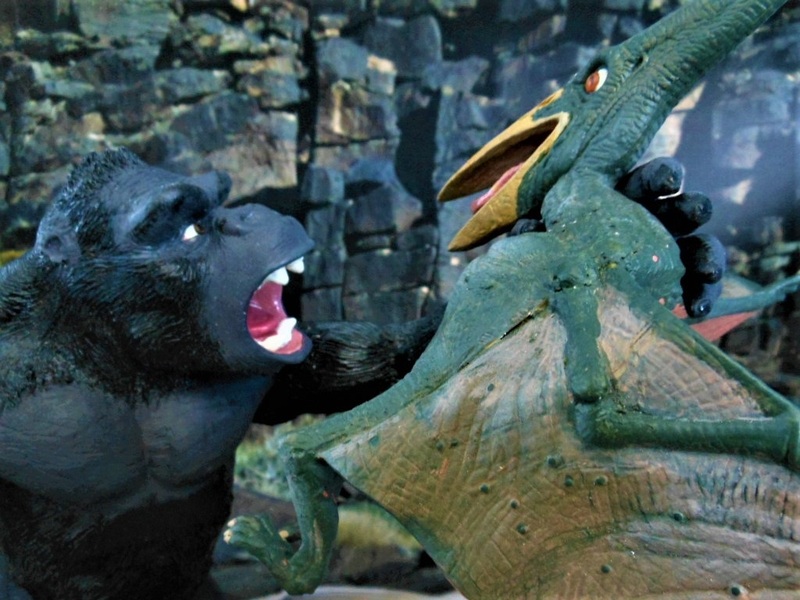 Kong was painted with gloss black for the furry areas and the bare skin a very dark semi-gloss gray. 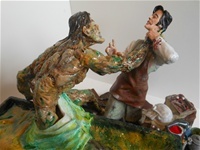 I was fortunate enough to find a Ann Darrow figure on eBay (where else?) which was just about perfect in scale. I ended up buying several of them should I decide to make another Kong build up. The base is made of wood and florist's green Styrofoam which I glued, gouged and chopped to suggest a rocky mountain lair. Once satisfied with the general construction, I made up a thin slurry of plaster of Paris and painted up the whole thing taking care to keep the brush strokes parallel to suggest striations and layering in the rock. After I let the plaster coating cure for a few days, I gave it a base coat of medium brown flat paint (primer actually) out of a rattle can and then finished up with a heavy wash of black stain to bring out the 'rock' features. My Ann Darrow figure I picked up on eBay. This is a nice little figure that cost me about four dollars and free shipping (!!!) from China. Sh'es laying on a bed of ferns that I cut from a plastic plant I picked up at a craft store. Click once for a larger image. 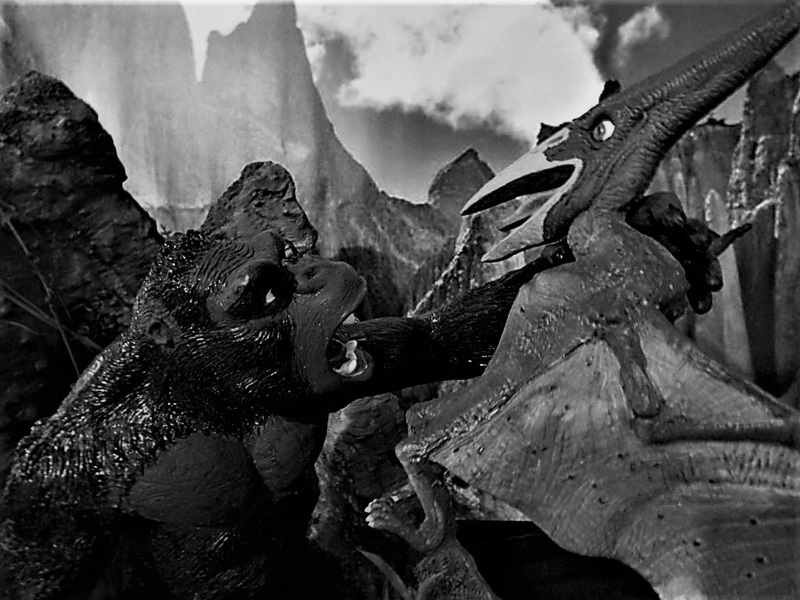 As I have done in the past, I'll post a black & white version of my build ups if the original film was in that format as was the case with "Kong". Click once for a larger image. I was never that happy with the way this build came out. Though it was my own design, the cliff base just wasn't up to par so when the whole thing fell off my shelf a couple months ago, my mind was made up for me. 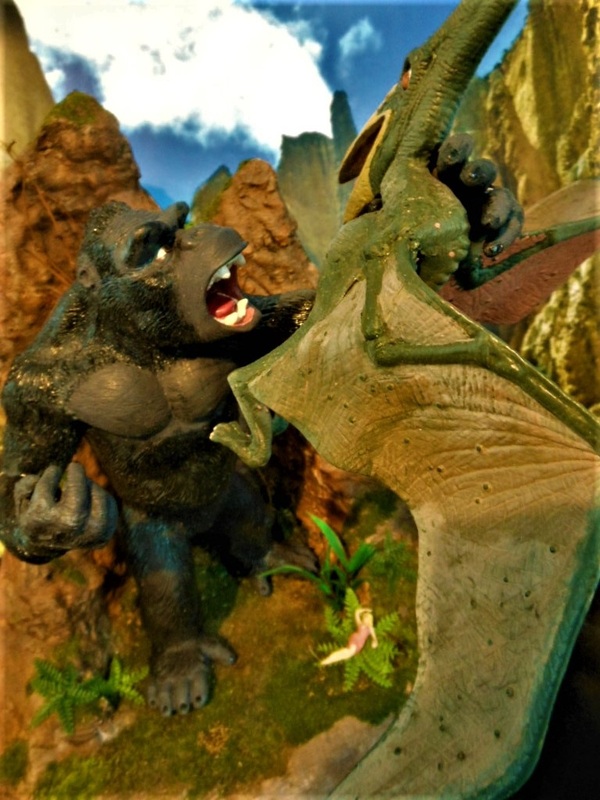 The vinyl Kong strangling the pteranodon broke in two at the waist and was a relatively easy fix. With some five minute epoxy and modeling paste followed by a quick touch up, he was good a new. The original base was intact but I just didn't like the look of it plus it weighed a ton so into the trash it went. I had some scrap pieces of two inch thick foam insulation laying about so I glued then together in a roughly fifteen inch diameter disk. Using a hobby knife, foam saw and steak knife, I cut and chopped at the surface and edges to resemble stone. After making a serious mess with that activity, I came back with a stiff wire brush and randomly brushed the edges and previously carved grooves to give them more texture and remove any areas that looked “fake” to me. After THAT mess got cleaned up, I made a base coat of medium brown and dark gray acrylic paints coarsely mixed together so avoid a uniform coating. After I applied the base coat, I came back right away on to the still wet base coat with a black wash made of India ink, water & rubbing alcohol in equal amounts which I dribbled here and there with an eye dropper. This wash highlights any grooves, gouges and the like to give a pretty presentable representation of weathered rock. The more you apply, the darker it gets though it does lighten somewhat after it all dries. Photo of the same build with a different base. Click for a larger image. The same shot but in black and white.